I had a great time yesterday recording a podcast with my friends Steve Boese and Trish McFarlane, founders and organizers of the groundbreaking HRevolution series of conferences. We talked about HR, the bind in which HR often finds itself when considering the acquisition of new solutions based on new technologies, HRevolution 2013 and the HR Technology Conference. We talked about HR because Trish is a CHRO; Steve is an HR technology guru; and I’m, well, as a business leader, I’m a huge supporter of the HR profession and HR professionals. We talked about Early Adoption because I’m leading a session at HRevolution: “Is Early Adoption in HR’s DNA?” HRevolution is a great one-day experience focused on learning, networking and new thinking in the practice of HR. It’s on October 6 in #VegasBaby — in the same venue and the day before the HR Technology Conference. Couldn’t be easier to attend! And we talked about the HR Technology Conference because Steve is taking over as Co-Chair and is also leading this year’s “Awesome New HR Technology” contest. If you haven’t registered yet, here’s the link. And be sure to use the promo code CHINA13 for a $500 discount! It was a fun conversation. 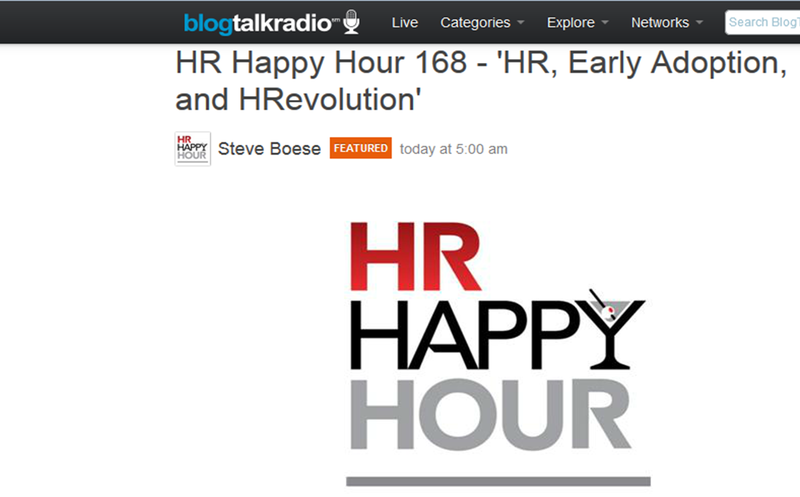 Take a listen here: HR Happy Hour 168 – ‘HR, Early Adoption, and HRevolution’ 08/09 by Steve Boese | Business Podcasts. In the land of HR, folks tend to think inside their bubble. And when it comes to social media, some are early adopters (think using social media for talent acquisition) and many are laggards (think writing policies that keep people from accessing Facebook while at work). But the truth is that there is so much more to social technology than social media. And HR needs to go to school on this. I was pleased to attend IBM’s Connect Conference last week. I was there to get insight into IBM’s acquisition of Kenexa and its commitment to building a Smarter Workforce – the brilliant marketing extension of their Smarter Planet campaign. Social business is huge. Social business at IBM is enormous — and growing. While at the conference, I received a copy of the IBM Institute for Business Value’s report titled, “The Business of Social Business: What Works and How it’s Done,” that should be required reading for every HR person. It’s a sort of primer explaining what social technology is and how it is transforming the way businesses are competing in the global marketplace. Based on survey data from 1,161 respondents and interviews with 21 executives responsible for implementing successful social business practices around the world, this report is easily consumed by non-technical business leaders (that’s you, HR pros) and creates a much larger context for understanding the opportunities that social technology brings to an organization — and that will be coming to your organization soon! I found it fascinating that when drilling down into the second bullet point, driving workforce productivity and effectiveness – HR’s domain – the focus was on learning and developing talent, not acquiring it. There’s a head snap for you. Take a look at the report and look for more useful information from the IBM Institute for Business Value. And download the free “IBM IBV” app for iPad and Android from your app store so you don’t miss any new research! HR + Early Adoption = Oxymoron? This is easy. The answer is not just no, but hell no! Despite the fact that Human Resources – Personnel, back in the day – has its roots in risk avoidance through an overarching focus on compliance, today HR is at the forefront of early adoption – especially with respect to human capital management software. I’ve written a white paper for Achievers (www.achievers.com) that will be available shortly. And the great HR Technologist Himself, Steve Boese, and I will be discussing this very topic in webinar on March 7 at 1:00 pm EST. Register here to join us. I’m thinking that this could be an epic point/counterpoint discussion that you won’t want to miss! Plus, you’ll get a complimentary copy of the white paper, Early Adoption: Against HR’s Nature? Steve Boese and me, an interesting webinar that will straighten your spine and put a swagger in your step, a free white paper and Achievers. Be there or be…I don’t know, ummm…Personnel. Don't miss a single post. Sign up to receive notification each time China updates her blog.